Strong hands give you a firm tennis grip. You don’t hit golf or tennis balls with your hands -- there’s a sport called handball for that. But the hands are your direct links to your golf clubs and tennis racket, so a strong grip can be helpful. Tennis, in particular, requires a solid grip on your one-handed shots. You don’t typically grasp a golf club as firmly as a tennis racket, but you’ll appreciate having strong hands when you have to blast out of a bunker. Squeeze and release a tennis ball or a similar object in your hand for 10 to 15 minutes. Repeat the exercise one or two more times each day. Alternatively, squeeze a large rubber ball and hold it for about 90 seconds. Perform the move three times with each hand, alternating hands after each repetition. Place your thumb against your index finger and press them together as firmly as you can, comfortably, for five seconds. Repeat the move by pressing your thumb against the middle, ring and pinkie fingers, respectively, to complete one repetition. Perform three repetitions. Exercise with a dedicated hand gripper. Notice which side of the gripper wire is straight and which is slightly rounded. Place the grip attached to the straighter wire in your palm. Lay the upper knuckles of your four fingers on the opposite grip and extend your thumb forward, toward the tip of your index finger. Squeeze the gripper, overlapping your thumb onto your index finger. Fill a bucket with rice. Thrust one or both of your hands into the rice and squeeze the rice for 30 seconds with your entire hands, or curl your fingers against the rice one at a time. Perform two repetitions with each hand. Grasp a dumbbell in each hand and let your arms fall naturally at your sides. Walk forward with your arms extended and your body erect for 30 to 60 seconds. 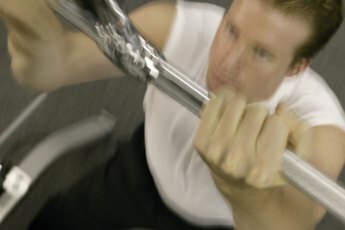 If you can’t hold the weight for 30 seconds, use lighter weights. Does Hand Size Affect Shooting a Ball? 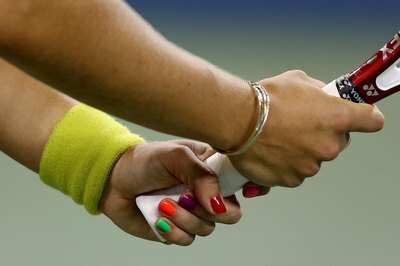 How Do Left-Handed Tennis Players Grip Their Rackets?